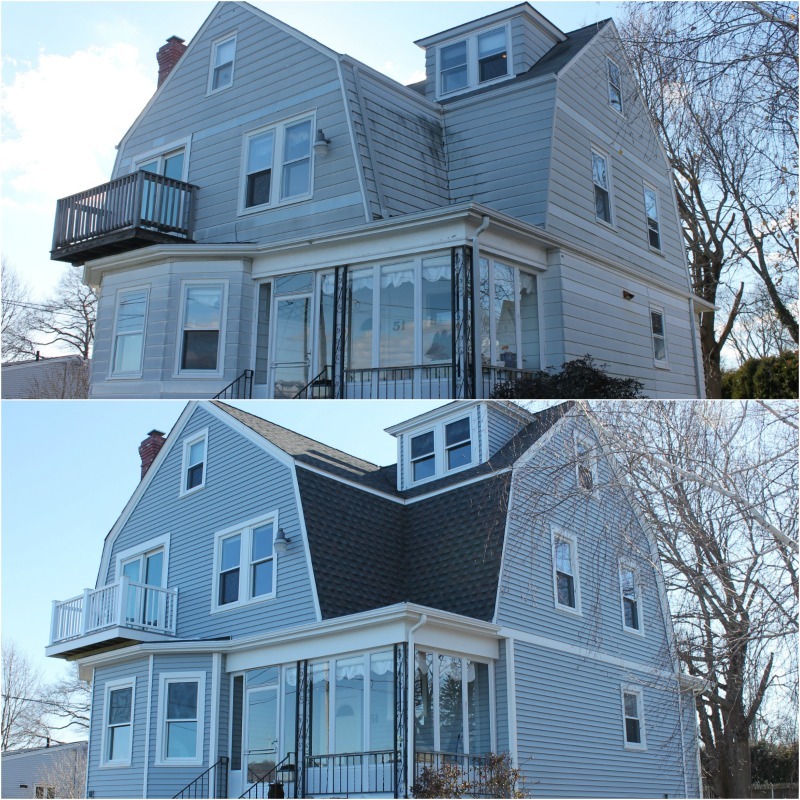 Vinyl siding, replacement windows, a new balcony, roof replacement and mansard restoration gave this waterfront Somerset, MA home a beautiful makeover! The first phase of this project was to replace the roofing system. A not-so-handyman had installed aluminum siding on the mansards of this home which was an aesthetic and functional disaster. It was not harmonious with the original character of the home and caused leaks. 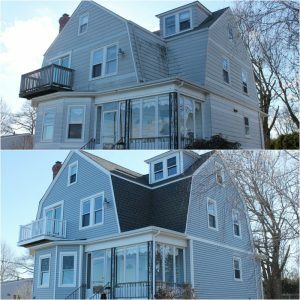 We removed the siding from the mansards, stripped all roofing and installed a GAF Timberline HD Lifetime Roofing System in Williamsburg Slate. We prefer GAF, America’s largest roofing manufacturer, as our go-to shingle. They are the only manufacturer in the roofing industry to completely re-engineer their shingles before upgrading their product warranties. This roof comes with a 50 year, factory registered, non-prorated warranty. Why is this important to a homeowner? If Care Free Homes spontaneously combusted and disappeared, our customer’s roof would still be completely covered by GAF! We installed Mastic Carvedwood 44 vinyl siding in the color, Everest. 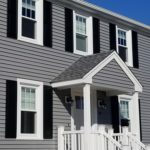 Manufactured for both beauty and durability, this vinyl siding replicates the look of painted cedar clapboards but doesn’t require the maintenance. Mastic siding comes in a variety of widths, textures, shadow lines, and colors. 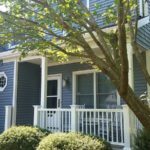 Mastic also manufactures vinyl siding that mimics the look of painted or dipped cedar shakes and shingles. 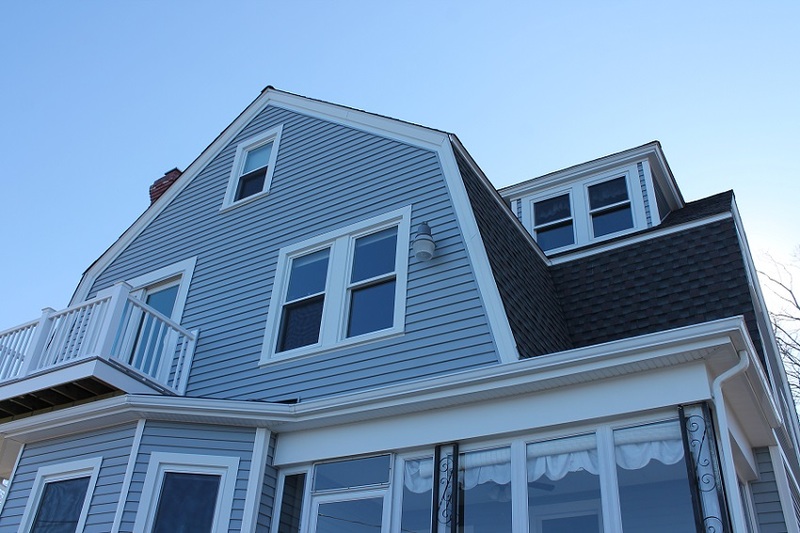 Learn more about their cedar shake and shingle style siding by reading this accompanying blog. Harvey Classic double hung replacement windows were installed throughout the home. Manufactured right here in New England, Harvey windows are a Care Free customer and family favorite! These energy efficient windows tilt in for easy cleaning and comes in a variety of grid patterns, colors, and hardware options. As the only Harvey Elite Series dealer based in SouthCoast MA, we are excited to offer our customers Harvey’s highest performing, triple glaze option! The second floor balcony was rebuilt using AZEK decking in Slate Gray and a TimberTech composite rail system in white. 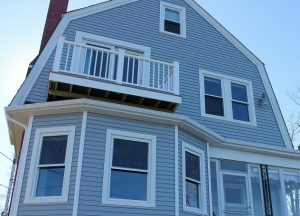 Because this home is located steps from the ocean, the customer needed deck products that could withstand constant battles with mother nature and the salty sea. AZEK and TimberTech products are engineered to be mildew, mold, moisture, scratch, and fade resistant. AZEK decking also comes in a variety of colors to suit every style. AZEK recently featured one of our favorite deck projects – check out the deck on this waterfront home in Fairhaven, MA. 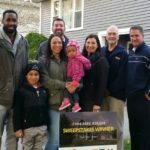 When the time comes to remodel your home’s exterior – give us a call at (508) 997-1111 for a no cost, no obligation estimate. Make your house a Care Free home!